When you have something fancy like fig butter that you don't want to just put on toast, you need to make something fancy with it. My thanks to the suggestions that came in for Test Kitchen - I went with lamb in a fig sauce but put a spin on what I threw together. 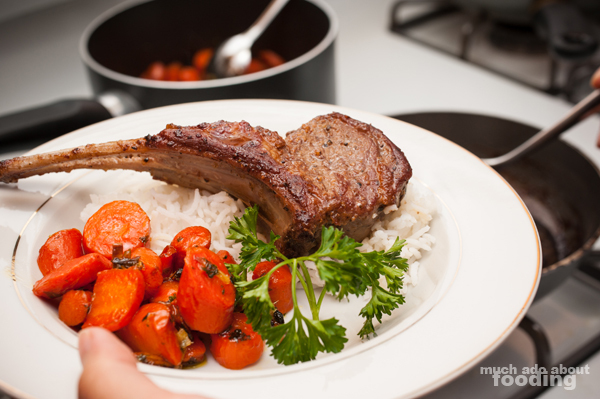 This recipe will contain three original recipes in itself: the lamb, the sauce, and the side. A threefer! For the lamb, I would have preferred to use a different medium besides the stovetop but didn't have a choice since I was cooking at Duc's which doesn't really have a working oven. *Remember that when cooking with alcohol, choose of the quality you would normally drink and not your throwaways because the taste really does matter. I used the Cruz Alta Malbec Reserve, a 100% Malbec from Mendoza, Argentina (8 months in 50% new barrels; 50% French and 50% American oak). Depending on how many servings you want to make, divide rack appropriately and rub generously onto each the chili powder, peppercorn, and garlic salt. Set aside. Peel carrots and slice in thick pieces. Into a separate bowl, finely chop parsley and peel & slice slivers of ginger. 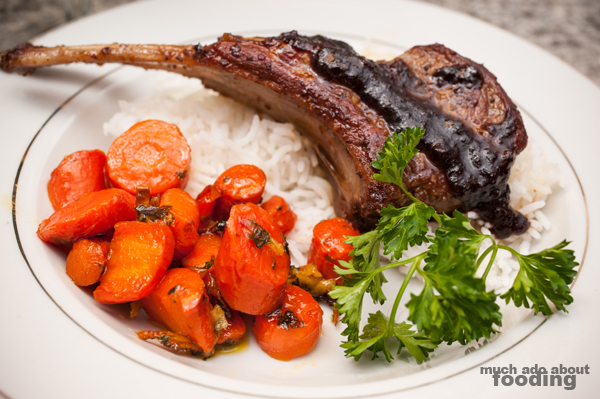 The longest wait during the making of this meal is caramelizing the carrots and making the sauce. If you won't be doing either of those, skip this step. In a medium saucepan, melt your butter and add in carrots and sugar. Keep on medium-low heat. In a separate and smaller saucepan, pour red wine on medium heat and add bay leaf. After 2-3 minutes, add fig butter and mix well. Reduce sauce to about half the original size; for thicker sauce, reduce to one third. After carrots have been mixed with butter and sugar for about 10 minutes, add in ginger and parsley. In a large skillet, turn on high heat and add oil. When hot enough, lay down cuts of your rack of lamb. Sear both sides on high. Then, reduce heat to medium high and cover with top; I do this to create trapped heat to cook deeper than the meat's surface. After about 2 minutes, turn over and leave uncovered. 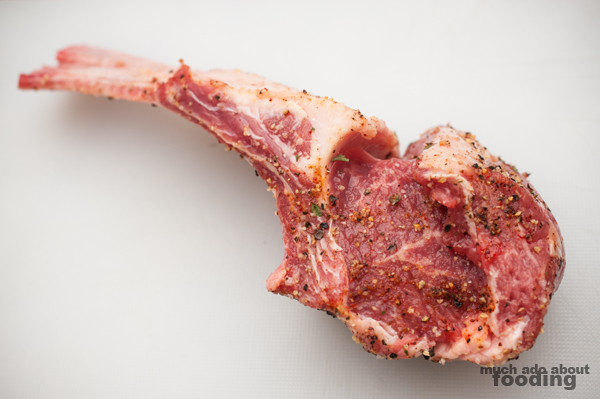 Lamb is tender in itself and should not be cooked to a "well" doneness so be aware of how long you have it on the stove. The carrots are done once they have browned a bit on the edges and are pierceable (I used a chopstick to test this); serve as a side dish. 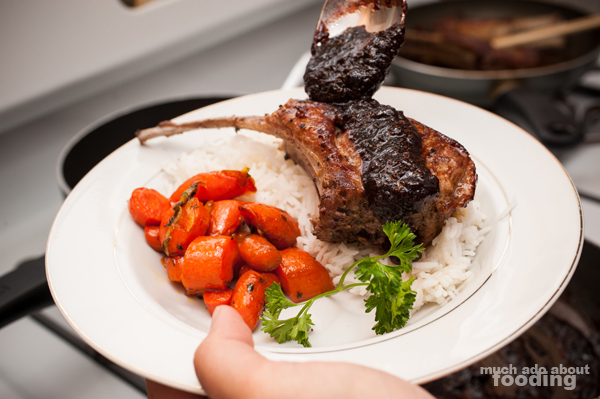 I served my lamb over a bed of basmati rice and under an appropriate amount of the sauce. 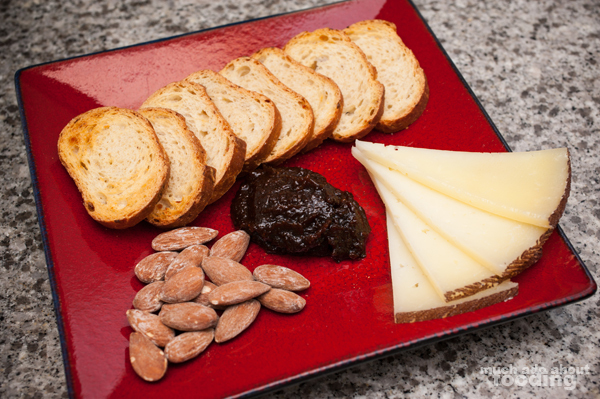 To complete your fancy night, consider a starter of good cheese with almonds, crisps, and some of that fig butter! This week's Test Kitchen ingredient: none. Thanksgiving is this week so for hopefully obvious reasons, I won't run a Test Kitchen ingredient for this week as response will probably be low. I'll bring up an ingredient next week or if you're curious, let me know what you want me to feature!